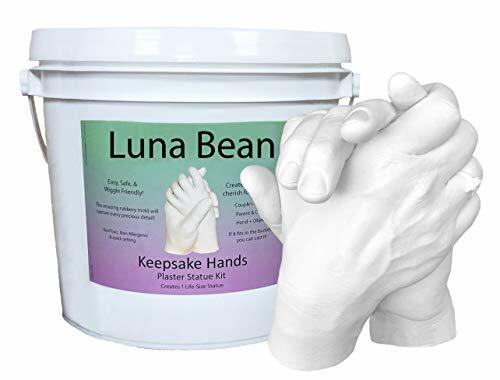 Luna Bean KEEPSAKE HANDS Plaster Statue Kit Preserve Every Precious Detail! This plaster casting kit for a pair of hands contains the materials to do 1 casting of the following types: 1 Large Adult Hand, 2 Adult Hands (Wedding Hands, Anniversary Hands, Praying Hands, husband & wife, father & daughter, mother & son, etc) 1 Adult & 1 Infant/Child (Mom & child, father & baby, grand parent & kid, etc) 2-3 Children under age 12 Included with this kit: Plastic molding bucket, 1 bag of molding powder, 1 bag of casting stone, fine sandpaper, course sandpaper, demolding stick, detailing pin and detailed instructions. Making the Mold: The molding material is cool setting, nontoxic and non allergenic. Wiggling is not a problem as long the hands remain submerged in the molding gel until it sets. The set time is about 6 minutes, which includes the mixing time. Other Items Needed: Large rubber spatula whisk, or large plastic spoon for mixing molding material, liquid measuring cup, glass or disposable bowl for mixing casting stone Optional Refill (casting powders only) to create an additonal statue: https://www.amazon.com/dp/B074DHGBKK Once the casting is finished, allow to dry in a well-ventilated room with as much natural light as possible for about 1 week Optional Finish: Painting and/or sealing your completed statue is not required, but it is recommended if it will be handled a lot. Optional Display Base: A display base can be added at a discount. Attach with tacky wax, crazy/super glue, epoxy or even a screw. Tips: If using glues, first sand the base surface where cast will be attached. If using a screw, place a screw receiver plug in the cast during the setting phase. - BEST SELLING CASTING KIT with 50% MORE molding and casting powders than other 2 person kits! INCLUDED: Plastic molding bucket, 1.5lb Step 1 molding powder, 2.75lb Step 2 casting stone, fine sandpaper, course sandpaper, demolding stick, detailing pin and detailed instructions. - PRESERVE EVERY PRECIOUS DETAIL! ♥ The unique rubbery mold captures every fine line and fingerprint for a perfect one of a kind treasured gift. The Step 1 aginate molding material is custom to Luna Bean kits. Slower set, better deteil and more bold color changing properties than other craft brands. - LARGER SIZE!★ Taller and wider bucket plus more molding & casting materials! ★ CAST HANDS: 2 Adult hands, 2 Adults + 1-2 small children; One large adult hand, Child & Adult, or 3-4 Young Children. See the Luna Bean -XL- kit if you need a larger size for up to 4 adults plus 1-2 children. - MADE IN THE USA ★ ... A FUN and MEMORABLE gift activity for family, couple holding hands, and friends to create a PRICELESS memory. Great for an anniversary, engagement, valentine's day, mom, dad ,or grandparents. - DO-IT-YOURSELF ✔ Hand Casting Kit - Finish with a clear all purpose sealant or acrylic paints (not included) or leave natural. 100% SATISFACTION KEEPSAKE GUARANTEE - If your casting does not turn out, send us a photo and we will work with you on a solution.